24026 MICRO HELICOPTER "HUE ATTACK"
Ford’s GT40 was a motorsports legend which dominated the prestigious 24 Hours of Le Mans race with four back-to-back victories between 1966 and 1969. Nearly 50 years on, and 2015 welcomed a newcomer with the legendary GT name, a revolutionary design upon which Ford have unleashed their passion for innovation: the Ford GT. It is based around a carbon fiber monocoque and endowed with a 647hp 3.5-liter EcoBoost V6 engine plus a 7-speed dual-clutch transmission, not to mention an aerodynamically-honed carbon fiber body: the result is a top speed of a cool 347km/h. A competition model took a magnificent class victory in the 2016 running of the 24 Hours of Le Mans. This is a 1/24 scale plastic model assembly kit. Length: 200mm, width; 94mm, height: 46mm. Refined aerodynamic form is captured with aplomb, with depictions of buttresses, door-side air tunnels and underside design. Body rear parts breakdown closely follows that of the actual car for super realism. Metal-plated wheels and oil tank depiction give an extra layer of realism. Shoulder sections and passenger seat dashboard are separate parts. 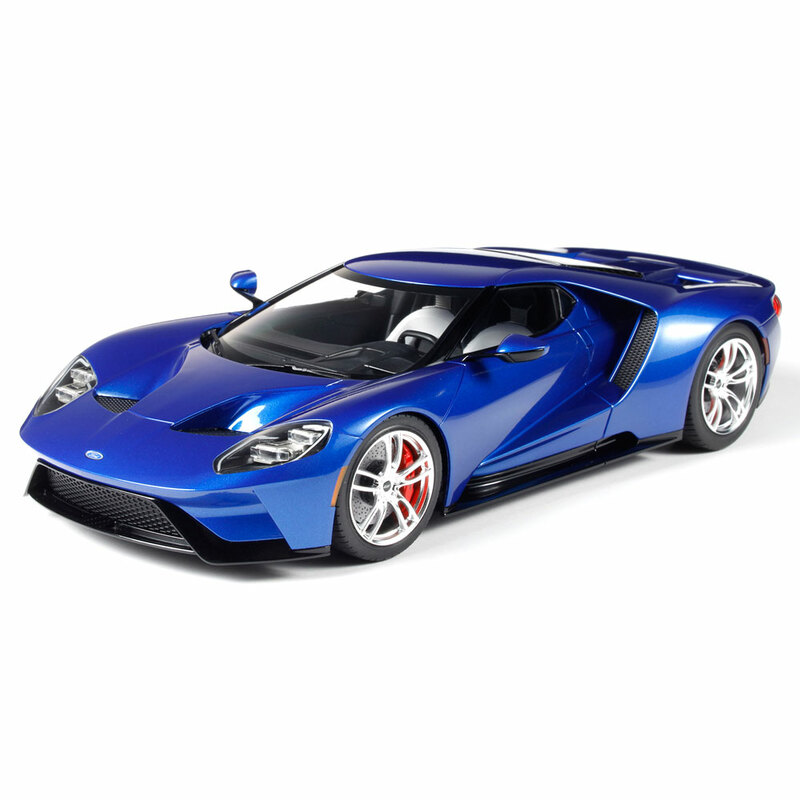 The sleek, inimitable Ford GT form is captured in realistic Tamiya 1/24 scale for an accurate and satisfying build. This kit includes optional stripe decals which are inspired by the GT40, one of the legends of Ford motorsport. Complex headlights are recreated with a streamlined yet rewarding assembly. Wheels are metal-plated. Body rear parts breakdown closely follows that of the actual car for super realism. Taillights are clear parts. The top of the 3.5-liter V6 is depicted in style, with plated oil tank, and visible through the rear hatch. Underside features distinctive dual layer underpanel with visible lower front suspension arms. This image gives a close-up look at the multi-splitter rear difusser, and the realistic tyre tread pattern. A full complement of decals and metal transfers is included, plus masking stickers for the paint job.